75 Years Ago, Scientists Conducted An Unprecedented Nuclear Experiment On Dec. 2, 1942, a group of scientists in Chicago created the first controlled, self-sustained nuclear chain reaction, which would prove essential to developing an atomic bomb a few years later. 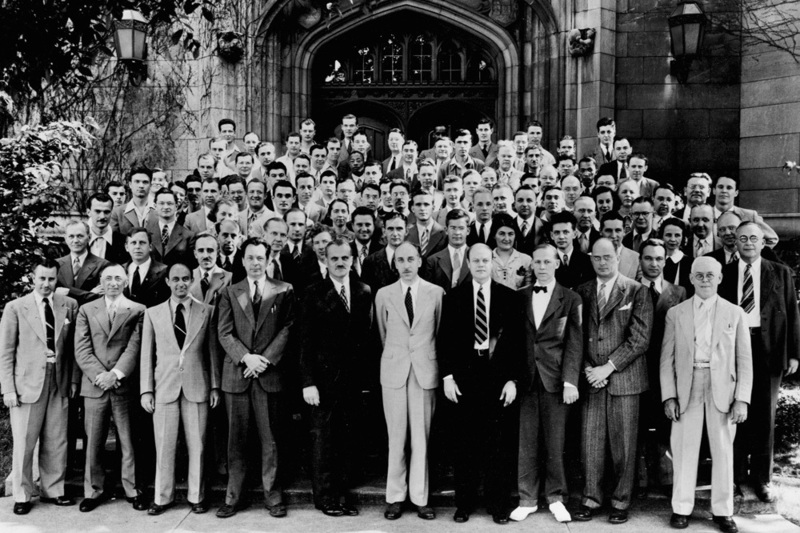 In 1952, atomic scientists came together on the 10th anniversary of the first controlled nuclear fission chain reaction, which took place Dec. 2, 1942, at the University of Chicago. The 1942 test was a crucial first step in the creation of nuclear weapons by the U.S. endeavor known as the Manhattan Project, says Eric Isaacs, executive vice president of research, innovation and national laboratories at the University of Chicago. "The way I like to think about it is: It was not enough to power a light bulb, but it changed the world," he tells Here & Now's Jeremy Hobson. "It changed, obviously, the world because the war ended some years later with the bomb." The coordinated effort to harness nuclear energy began in 1939 after scientists in Europe demonstrated fission of a nucleus for the first time, Isaacs explains. Many scientists in the U.S. were expatriates, some of whom were refugees from fascist Europe, and they quickly realized the potential that Germany could build a bomb. According to NPR contributor Marcelo Gleiser, Hungarian physicist Leó Szilárd first proposed the idea of a nuclear chain reaction, "whereby neutrons released from radioactive atomic nuclei would hit other heavy nuclei causing them to split (fission) into smaller nuclei. Every time this splitting happened, a little bit of energy was released. "Szilárd knew that the possibility of a chain reaction represented a shift in world history," Gleiser, a professor of physics at Dartmouth College, writes. "An explosive device with an uncontrolled chain reaction would have devastating consequences." A group of scientists persuaded Albert Einstein, the most famous scientist of the day, to write President Franklin Roosevelt urging him to launch a major bomb-making effort. The letter essentially said, "If we don't build a bomb, Germany will first." The 49 attending scientists and observers fully trusted this Nobel Prize winner, called the "Pope of Physics" by his admiring peers because of his scientific infallibility. 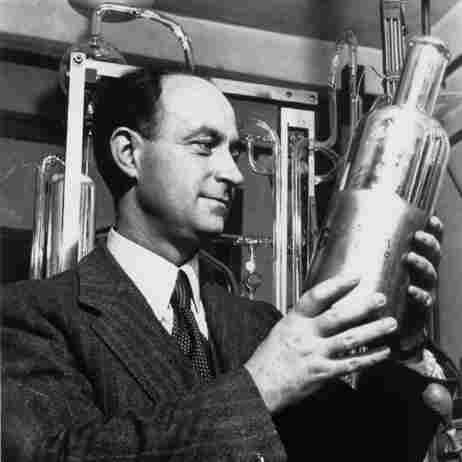 At 3:25 in the afternoon, after ordering the last control rod to be pulled halfway out, Fermi announced the pile had "gone critical." The chain reaction gradually accelerated, reaching dangerous levels ever more quickly. After the neutron count dramatically intensified at 3:49 p.m., Fermi continued to run the pile for nearly 5 minutes before calling a halt to the experiment. But those minutes marked the beginning of a new era. 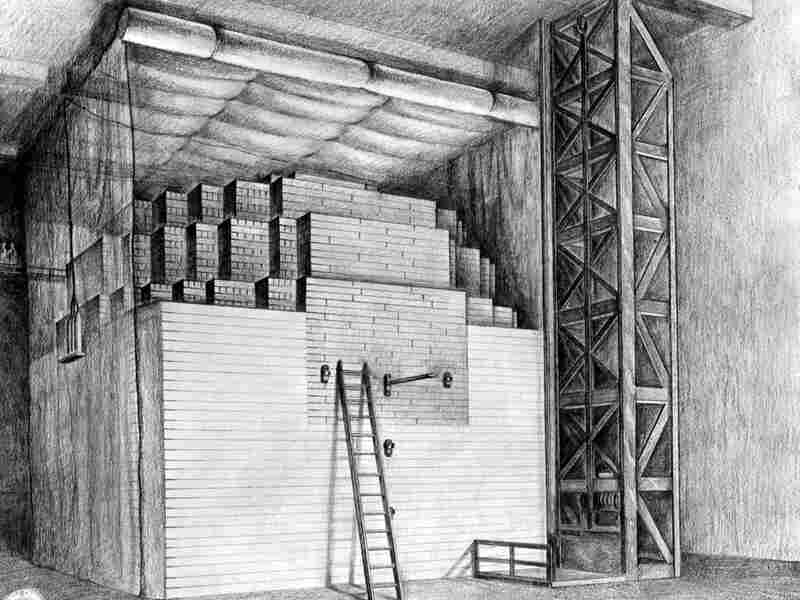 A drawing of Chicago Pile 1, the nuclear reactor that scientists used to achieve the first controlled, self-sustaining chain reaction on Dec. 2, 1942. While the reaction only produced a small amount of energy, Isaacs says the event was a "remarkable engineering feat" that dramatically changed the landscape of science. Three years later, the U.S. dropped the first atomic bomb on the Japanese city of Hiroshima. Despite the unprecedented destruction created by the bomb, Isaacs says nuclear power plants, as well as other nuclear materials, wouldn't exist without Fermi's experiment. The experiment demonstrated that generating "nuclear power releasing the energy of one nucleus is not nearly enough," Isaacs explains. "You have to re-release the energy of many, many nuclei to create the kind of energy that are required for nuclear-produced electricity." On The Alien Question: Where Are They? At a time when there is rising concern about the temperament of world leaders in control of nuclear weapons, Isaacs says the scientists who worked on the pile experiment "realized the devastating consequences of the kind of energy they could release with fission." But the fear that drove them to move forward, Isaacs says, fundamentally changed the role of science in our society. "There were very loud debates going on amongst the scientists about whether we should use a bomb, whether we shouldn't use a bomb, how it should be done," he says, "and in fact, out of World War II, one of the things that emerged was the engagement of scientists in discussions around policy."